Going through the eviction process is an inevitable part of being a landlord. Evictions, especially in California, tend to always favor the tenant and can be a very frustrating, slow, and expensive process. Although there are already a few “top 10 reasons to evict a tenant” lists out there, those are just generalized to cover the majority of the states’ reasons. 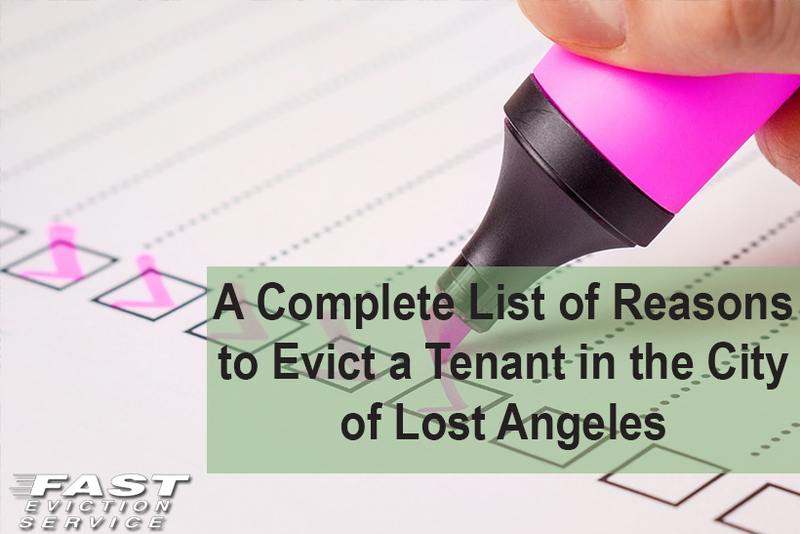 Below, we have compiled a very extensive and thorough list reasons a landlord can start the eviction process specifically in the City of Los Angeles. The tenant failed to pay the agreed upon rent to which the landlord is entitled, which also include amounts due under Subsection D of Section 151.06 of the Los Angeles Municipal Code Rent Stabilization Act. The tenant has violated a lawful obligation of the tenancy, other than the obligation to surrender possession upon adequate notice, and has failed to cure such violation after having received written notice thereof from the landlord. The tenant is committing or permitting a nuisance in or is causing damage to the property, or to the appurtenances thereof, or to the common areas of the complex containing the property, or is creating an unreasonable interference with the comfort, safety or enjoyment of any of the other residents of the same or adjacent property. The tenant is using or permitting a rental property to be used for any illegal purpose. The tenant, who had a written lease or rental agreement, which terminated on or after the effective date of this Chapter, has refused, after a written request or demand by the landlord to execute a written extension or renewal thereof for a further term of like duration with similar provisions and in such terms as are not inconsistent with or violate of any provisions of this Chapter or any other provision of law. The person is possession of the rental unit at the end of a lease term is a subtenant not approved by the landlord. The landlord seeks in good faith to recover possession of the rental unit for use and to be occupied by: a. The landlord, or the landlord’s significant other, children or parents provided the landlord is a natural person and not a corporation; or b. For a resident manager, providing that: no other vacant unit is available for occupancy by a resident manager; except that where a building has an existing resident manager in order to replace him/her with a new resident manager. (Amended by Ord. No. 716,544 Eff. 5/2/05) The landlord, having complied with all applicable notices required by law, seeks in good faith to recover possessions so as to undertake primary renovation work of the property or the building in accordance with a Tenant Habitability Plan (THP) accepted by the Department, and the tenant is unreasonably interfering with the landlord’s ability to implement the requirements of the THP by engaging in any of the following actions: a. The tenant has failed to temporarily relocate as required by the accepted THP; or b. The tenant has failed to honor a permanent relocation agreement with the landlord pursuant to Section 152.05 of this Code. (Amended by Ord. No. 177,901 Eff. 9/29/06) The landlord seeks in good faith to recover possession of the property under either of the following conditions: a. To demolish the property; or b. To remove the property permanently from the rental housing use. (Amended by Ord. No. 172,288 Eff. 12/17/98) The landlord seeks in good faith to recover possession of the property in order to comply with a governmental agency’s order to vacate, order to comply, order to abate, or any other order that needs vacating of the property as a result of a violation of the LA Municipal Code or any other provision of the law. (Amended by Ord. No. 173,224 Eff. 5/11/00) The Secretary of Housing and Urban Development is both the owner and plaintiff and seeks to recover possession in order to vacate the property prior to sale and has complied with all tenant notification requirements under federal law. (Amended by Ord. No. 180175 Eff. 9/29/08) The property is in a Residential Hotel, and the landlord is evicting to convert or demolish the property as defined in Section 47.73 and the Department has approved an Application for Clearance. (Amended by Ord. No. 181744 Eff. 7/15/11) The landlord seeks in good faith to recover possession of the property to convert the property to an affordable housing accommodation in accordance with an affordable exemption issued by the Department. Hopefully this article has shed some more light into which reasons are considered justified to start the eviction process against a tenant in the Los Angeles City area under the Los Angeles Municipal Code Rent Stabilization Act. Are there any other reasons you think should be included in this list? We’d love to hear from you. Our California Eviction Court System - The Wild, Wild West!